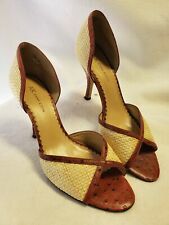 New ListingWomens Shoe Anne Klein 9M white patent leather/burlap 4"
They are gently used and in very good condition. They are BLACK patent leather in color. They say they are leather upper, man made soles. They are gently used and in very good condition. They are BROWN patent leather in color. They say they are leather upper, man made soles. Upper material is in excellent condition. See pictures for details. INEVER list fakes or knock-offs. 2.5" Kitten Heel. 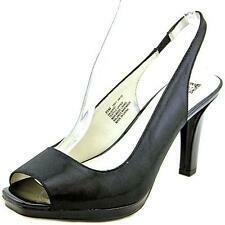 For sale is a pair of basic classic black heels from Anne Klein. The shoes are iflex and are in great shape. The heel is right at 3" so one you can wear with comfort. They are previously owned but the owner took great care with them and they look great. EUC - these have been worn and show light signs of wear with tons of life left. approx 4 1/4 heel height - 1" platform. these are a really pretty pale gold/beige (not a yellow gold) - woven covered platform/wedge. 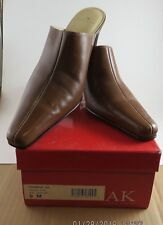 Anne Klein Slingback Shoes Brown with ‘AK’ log Size 9 3” heel. When you are finished, you can check out. We believe that pictures speak louder than words and do our best to show several photographs of each item, including any flaws we find. 100% authentic! view the pics! Pleated Peep Toe. Very Stylish nice heel! Ankle strap with buckle. Heel height: 3". Shoes are in very good preowned condition. Color : Black. 3.5” heels 👠. Man made materials. Round toe. Made in Italy. New without box. Excellent condition. Heel - 3 5/8". Size: US 9 EU 39.5. Heel Height: 3 3/4". Material: Leather. Color: Black. BeautifulAnne Klein Jeweled Heels. I do not need all of these clothes now and most have been wore only once if at all. Cleaning out my closet to make room for more. Black Pewter White Leather Mule Sandal. Anne Klein. They are a lovely beige leather heel in a cut out design and pointy toe style. These shoes are in wonderful preowned condition and will look like new on your feet. NEW AK ANNE KLEIN GOLD TAN PATENT. - 3.25" Heel. Feel free to ask! - New / Excellent / Sticker on footbed. Black Anne Klein shoes - Size 9 Medium. Condition is Pre-owned. Shipped with USPS Priority Mail. Anne Klein Velvet Print Block Platform Heel Size 9. Shipped with USPS Priority Mail. New without box. Never worn, only tried on. Velvet feel to it. Leather upper, man made lining. Pointed toe. Block heel. 2-3 inch approx. Here is a pair of gold slingbacks from Anne Klein Vero Cuoio. 3 1/2" heel. We will normally get back to you within 24 hours.